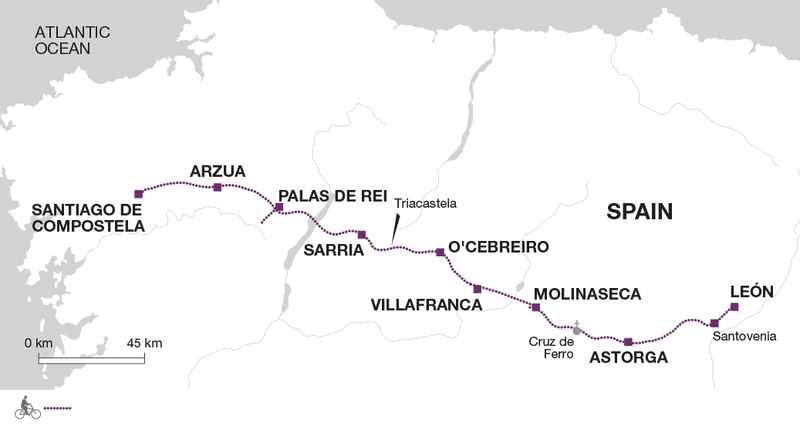 Cycle the legendary pilgrimage trail from Leon to Santiago de Compostela. On this scenic ride through northern Spain pass historical monuments and pretty villages along the way, often in the company of other pilgrims. Historic Camino de Santiago - Receive your Compostela pilgrim's certificate. After arriving in Leon and checking into your hotel, we recommend spending time exploring this historic city. Situated in the heart of the Spanish Meseta (high plateau), Leon was once the centre of Christian Spain, at a time when two thirds of the peninsula was under Muslim rule. The city's great Gothic cathedral and the equally superb Romanesque Basilica de San Isidoro are among the finest examples of their architectural style to be found in Spain. The cathedral, in particular, is unique for the quality and magnificence of its stained-glass windows, which span seven centuries and cover subjects as diverse as religion, mythology and even medieval life. Your included rental bike will be delivered today or tomorrow morning depending on your arrival time and you will be required to sign an agreement of care upon receipt of the bike. After you have tested and adjusted your rental bike, you start your Camino journey with a gentle ride through the plains of Castille to the small town of Astorga. Once a strategically important staging post on the Roman route to Andalucia, it was from Astorga that the Romans controlled the traffic of gold from mines in the nearby Las Medulas hills. The town is home to some fine medieval architecture, including a superb cathedral that is worth exploring. However, it is the Palacio Episcopal that is its most famous asset. Designed by Antoni Gaudi, the Modernista architect at the end of the 19th century, the magnificent palace was built to replace its predecessor, destroyed by a fire. Unfortunately, its radical design and horrendous costs resulted in it never being used and it now houses a unique collection of artefacts and treasures devoted to the town's history. Tonight's accommodation is the first of many gems on the trip. Once the Earl of Tepa's glorious residence, when Napoleon came to Astorga during the French siege of the town, he stayed at this home after the conquest. Your total cycling distance today is approximately 48 kilometres. As you leave Astorga, the scenery takes a dramatic change, from the expansive high plateau of La Meseta, towards the rolling landscapes of the Bierzo Mountains. Your route will take you through Castrillo de Los Polvazare, one of the finest Medieval villages in Castille, before ascending higher into the hills to reach the Cruz de Ferro (Iron Cross). This is the highest point of the Camino at an altitude of 1482 metres. As one of the most significant points on the route, pilgrims have been leaving stone offerings here for centuries, in the hope that they would offer protection for the rest of the pilgrimage. In good weather, you are likely to be able to see the mountains of Galicia for the first time in the distance. From here, it is mainly downhill to the small village of Molinaseca, where you will spend the night. Your total cycling distance today is approximately 49 kilometres. Today's more leisurely ride heads for the city of Vilafranca del Bierzo - an important gateway to Galicia. En route, you will pass through Ponferrada - another town founded by the Roman gold mining industry and home to an impressive 12th century Templar castle which occupies an area no less than 8000 square metres. Tonight's hotel accommodation is ideally located in Vilafranca del Bierzo's pretty and historic town square. On the ground floor, you will find the oldest pharmacy in Spain, which has been converted into a museum. Your total cycling distance today is approximately 30 kilometres. Today's ride into Galicia is small on distance but big on gradients as you face a six-kilometre climb up a dirt road to your night stop in O Cebreiro. If you prefer, this steep climb can be avoided by following the old national road to the Pass Pedrafita and then taking the tarmac road to O Cebreiro. Sitting high above a patchwork quilt of green valleys, O Cebreiro is a remarkable and emblematic village, full of legends and stories related to the Camino. The village is famous for its 'pallozas' - traditional circular thatch-roofed houses. Its impressive Romanesque church dates from the 11th century. Your hotel is just next door. Your total cycling distance today is approximately 29 kilometres. After an initial short ascent, today's ride is mostly downhill. Deep in the rural heart of Galicia, the scenery takes on a mantle of lush vegetation, ancient forests and small rural hamlets. Cycling through the village of Samos, you may choose to stop and visit the delightful Benedictine monastery - one of the most important in Galacia. Although founded in the 6th century, it was continuosuly reformed until the 18th century. From here, you will pedal on to your nightstop in Sarria - Galicia's principle town. Situated on a hilltop with a river on either side, the town commands great views of the region. Your total cycling distance today is approximately 47 kilometres. On today's ride, you will accomplish a total ascent of 725 metres, but this will be staggered with climbs of no more than 200 metres at a time. The rural landscape that you cycle through continuously changes and you will pass plenty of village cafés and restaurants in which to meet fellow pilgrims. Your total cycling distance today is approximately 52 kilometres if staying in Palas de Rei or 59 kilometres if staying at Parada das Bestas. Today's ride is gentle and undulating day as you cycle from one village to another. Dairy production is the main industry in this area, although the pilgrimage trade is also important. At our night stop in Arzúa, we can look forward to more characterful accommodation. Here, our hotel is a converted traditional Galician manor house, known as a Pazo. Your total cycling distance today is approximately 33 kilometres. Your final day's cycling sees the landscape flatten for your last push to Santiago. If you choose the standard route, you will peddle through the outskirts of Santiago and via the famous Monte del Gozo. This hill translates as the 'Hill of Joy' as it is the place where pilgrims catch their first glimpse of the cathedral. If you would prefer to take a more scenic route, you can cycle via Touro, adding about 11 kilometres to your day's total distance. Cycling into the heart of Santiago, your journey ends at the gates of the 12th century Baroque cathedral that towers over the surrounding city streets and is one of Christendom's holiest shrines. Indeed, after Jerusalem and Rome, this city was once the most important place of pilgrimage anywhere in the Christian world. The tomb of St. James is believed to lie in the crypt beneath the cathedral altar, part of the original 9th century foundations of an earlier basilica. After checking into your hotel, you may choose to explore more of Santiago on foot. Alternatively, you may prefer to relax with a well-earned glass of something, reflecting on the incredible journey you have undertaken in the footsteps of so many before you. Your total cycling distance today is approximately 39 kilometres (with optional extra 11 kilometres). There are numerous opportunities throughout this trip to stop of at monuments and religious historical sites. The following are particular places to note. Day 1 - In Leon visit the Gothic cathedral & Basilica of San Isidoro (entrance cost around 8 Euros). Day 4 - Visit the Castillo de los Templarios on your way through Ponferrada. Day 6 - It is well worth stopping in Samos to see the monastery (entrance cost around 10 Euros). Day 9 - Spend time at the end of the cycling to explore the Romanesque Santiago cathedral. Perhaps eat tonight at a Tapas bar. Bring cycling gear such as quick drying cycle tops, padded cycle shorts and cycle gloves. Remember that the weather is slightly more changeable in northern Spain, and it can be cool, especially at night and at the start and end of the season, so bring a warmer jacket/fleece. A waterproof cycle jacket is recommended in case of rain. A light windproof jacket is always useful. Arrival - Madrid, Valladolid or Asturias. Departure - Santiago de Compostela or A Coruña. We\ d recommend outbound flights into Oviedo (Asturias), Madrid or Valladolid Airports which are served by both budget (including Easyjet, Ryanair) and non-budget airlines (including British Airways) from multiple airports in the UK. We'd recommend return flights from Santiago or La Coruna Airports which are served by budget (including Vueling) and non-budget airlines (including Iberia). Premium - Hand-picked and chosen for their character, location or local importance, these properties have excellent facilities and a higher level of comfort and service. They provide the perfect wind down after an active day. At the start of your trip you can fly into Oviedo (Asturias), Madrid or Valladolid Airports. From Oviedo (Asturias) airport to León there are 15 buses per day. Duration 3 to 4 hrs depending on traffic. Often you have to change buses in Oviedo or Gijon. There are 4 to 5 daily buses from Madrid airport to Leon. Duration 3.30 to 4.30hrs. At the end of your trip you can fly back from either Santiago or A Coruña airport. Between Santiago bus station and Santiago airport there are daily buses every 30 mins that run from 6.20am to 11.50pm. A private departure transfer can be arranged (at additional cost) from Santiago to either Santiago airports. This must be booked in advance. Mon 1 Apr 2019 - Fri 26 Apr 2019 Your trip can depart anytime between the above dates. Contact us for triple room requests and solo traveller prices. Sat 27 Apr 2019 - Wed 1 May 2019 Your trip can depart anytime between the above dates. Contact us for triple room requests and solo traveller prices. Thu 2 May 2019 - Sun 14 Jul 2019 Your trip can depart anytime between the above dates. Contact us for triple room requests and solo traveller prices. Mon 15 Jul 2019 - Sat 14 Sep 2019 Your trip can depart anytime between the above dates. Contact us for triple room requests and solo traveller prices. Sun 15 Sep 2019 - Fri 25 Oct 2019 Your trip can depart anytime between the above dates. Contact us for triple room requests and solo traveller prices. Wed 1 Apr 2020 - Sat 31 Oct 2020 Your trip can depart anytime between the above dates. Contact us for triple room requests and solo traveller prices.